In a content-cluttered world, could podcasting be the next big play for content marketers? Maybe “big play”’ is a stretch – a survey from Edison Research and Triton Digital shows consumer awareness about podcasting is flat. Yet the same research also shows podcasting holds broad appeal. Men and women listen with equal frequency, and there is no age barrier among listeners – all age groups are equally represented. Podcasting is particularly appealing for marketers because regular listeners tend to be better educated and have higher household income than the general population. What’s more, podcasts have particular appeal among commuters. Consider that high-wage earners in London commute for over an hour on average. And in major U.S. cities like New York, San Francisco, Los Angeles, and Boston, commute times are 30 minutes on average … the perfect amount of time to make podcasting a daily habit. And perhaps the most attractive quality of all: As a channel, podcasting isn’t super-saturated … yet. Only 3% of marketers say they use podcasts as a content marketing tactic. Podcasting pioneer Todd Cochrane has recorded more than 1,000 episodes of his Geek News Central podcast. He’s also the CEO of RawVoice, a media company providing services and podcast media statistics to 30,000 audio and video content creators. Cochrane advises aspiring podcasters to question whether they’re prepared to make a yearlong commitment to creating a successful podcast. He cautions that podcasting is work. You have to be passionate about the content, enough to speak about it for hours on end. If you don’t have enough content to carry you past episode seven, podcasting is probably not the medium for you. Passion won’t help if you don’t follow a rigid publishing schedule. Listening might be on demand, but your audience builds your show into their life. They want you to drop an episode at a prescribed time. Catering to your audience is essential for long-term success. They demand consistency and expect to be the center of your universe. The goal for your podcast should be authenticity, not perfection. Recording a 20-minute podcast is much faster than writing a long blog post, but newcomers to the medium often make extra work for themselves by trying to edit out every “um” and “ah.” Focus on the content and be confident your audience prefers to listen to a real person, not a highly edited humanbot. Podcasting is not a quick medium. 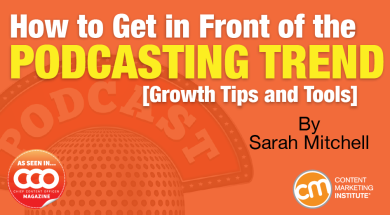 Too often podcasters expect huge listening numbers without taking time to build an audience. According to Cochran, the average podcast in the United States has between 3,000 and 5,000 listeners, and that audience usually takes months or years to build. It’s an open secret that podcasters lie about their show traffic but it’s not easy to pin down the true numbers. Each podcast hosting company reports statistics differently. iTunes, the channel with the most listeners, gives little information about traffic. Subscribers download individual episodes to which they may never listen. A single listener can download the same episode on different devices and still not listen to any of them. An active audience will show itself in the trend line of downloads and plays over a 90-day period. Determine how your podcast is doing by keeping an eye on a long-term trend. Don’t spend too much time delving into short-term analytics. Your time is better spent on preparing a great topic for your next episode. As consumers hook into popular radio programs converted to podcasts, like Alec Baldwin’s Here’s The Thing, or discover original programming like Serial, they begin to look for other opportunities to program the time they spend listening to audio. Before you jump in to this burgeoning medium, consider whether you have enough content to get past the seventh episode and beyond the 25th. Are you able to spend all day talking about your topic? Do you have a habit of reading and writing about the subjects you would discuss on your intended podcast? If so, now is a good time to get in front of the podcasting trend before the field is crowded and cut-through becomes difficult. Interested in cranking up your own podcast listening? You won’t go wrong with these podcasts if you’re working in content marketing. PNR This Old Marketing: If you want to know what’s happening in the world of content marketing, Joe Pulizzi and Robert Rose provide expert opinion designed to help you attract and retain customers. Each episode includes a terrific marketing example from the past and a popular rants-and-raves segment. BeanCast: Claiming to be “the best marketing podcast anywhere,” Bob Knorpp discusses current issues and events with marketing specialists and industry professionals. A professor of marketing strategy and execution at New York University, Knorpp provides theoretical insight unavailable elsewhere. 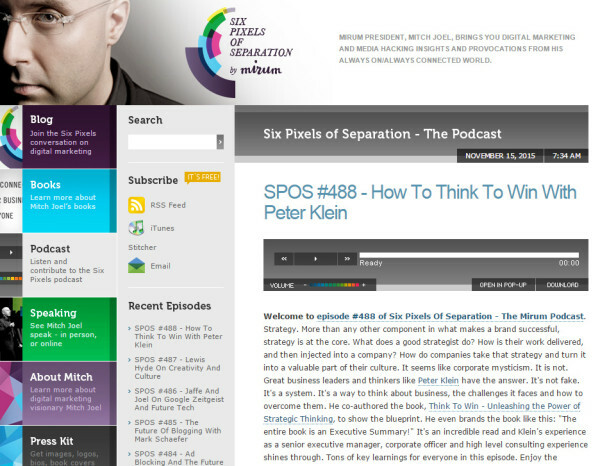 Six Pixels of Separation: Mitch Joel focuses on “marketing with an edge,” finding marketing opportunities created by your customers. He challenges his guests to reach into their core beliefs and back up their claims with experiences and evidence to help you better understand the complex world of digital marketing. 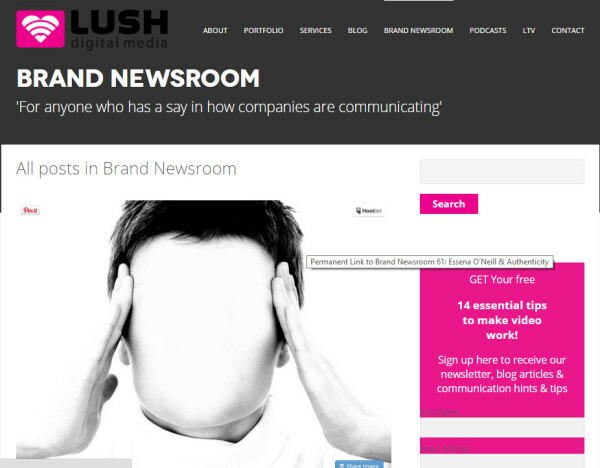 Brand Newsroom: With a focus on content marketing and brand journalism, hosts James Lush, Nic Hayes, and Sarah Mitchell (that’s me) deliver a global perspective on content, media, and PR. This 20-minute weekly podcast offers practical advice and great tips for anyone who has a say in how companies communicate. Marketing Over Coffee: Hosts John Wall and Christopher Penn break down the complexities of modern marketing into actionable elements. Good for both beginners and seasoned pros, Marketing Over Coffee is particularly good for search, social, and email marketing. Quality show notes help new listeners find you when searching topics related to your show or a specific episode. You can post these as part of an existing blog or create a dedicated website for your podcast. Transcribing your podcast and posting it online is another great way to attract organic search results. Use transcription software like Speechpad or Dragon to alleviate the burden of doing it yourself. 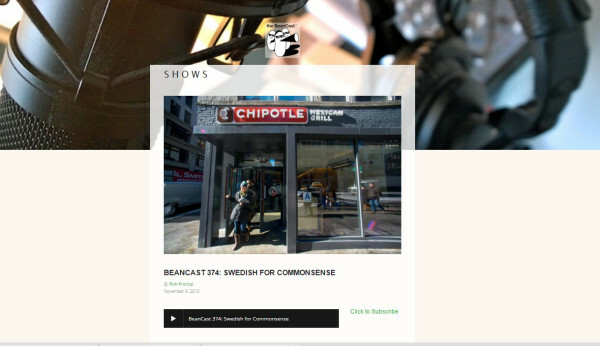 Create a complementary blog post on the same topic and include an audio player of the episode in the body of your post. Set up a Facebook page for your podcast and post each new episode along with a keyword-packed synopsis. Use your LinkedIn company page (or create a page specifically for your podcast) to promote new episodes. Set up a Twitter feed for your show. Include a photo for each episode in your tweets to improve engagement. Don’t be shy about retweeting your episodes as your podcast grows. Offer relevant podcast episodes to conference organizers and networking meeting planners to help them promote their events. Everyone loves free content. Ask your guests to promote their appearance on your show in their networks. List your podcast in as many directories as possible. In addition to iTunes, Stitcher, Libsyn, and SoundCloud, seek out smaller directories as well.